I'd first discovered this show by reading a deeply personal, thoughtful review that went into in-depth analysis of it. There are people out there to whom it's speaking very directly. Furthermore Season 1 was made by Brain's Base, although they didn't do Season 2. I watched it... and to my surprise it's a fairly standard "losers and weirdos help people in their school club" formula. It's funny. It's very good. It didn't look mould-breaking or anything, though. The show's a study of loneliness and solitude, but in a comedy way. Our heroes' self-worth tends to be in inverse proportion to their social skills, so Yui is very much the follower of the team while Hikki and Yukinon are very pleased with themselves. HIKKI - the show's protagonist. 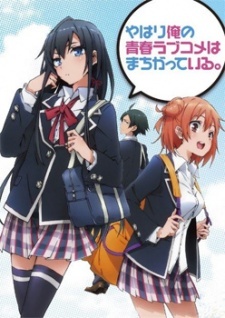 This is a light novel adaptation, so you might expect him to be a loner who's bad at getting on with people but will nonetheless turn out to be the super-popular hero who can do everything and is secretly loved by all the girls. Ahahahaha, no. Hikki is a total dork. He avoids talking to people and studies his classmates much like an anthropologist might study wild apes. He's cynical. He has no shame, no pride and will abuse people to their faces. He doesn't have social skills, but rather anti-social skills that he's spent his life refining into ninja superpowers that are useless for everything except trying to fathom the motives of other losers. What's more, he's proud of this. He's twisted his inability to relate to people into a philosophy of life. In any other show, he'd be pathetic... but here, he's being bludgeoned into altruistic acts (spit) and he's very funny. Underneath, he's actually a nice guy. Creepy, lazy, fish-eyed, fond of brutally cynical deconstructions and with a horrible outlook on life, but a nice guy. He can't believe that anyone might even like him. Yui does. It's not hard to see. However Hikki acts like a jerk to her whenever she's trying to get close in that way, because he's locked his self-image into being a lonely outsider. YUKINON - clever, beautiful, rich and with a turn of phrase that could flay the hide off an elephant. She's not proud of being lonely, unlike Hikki, but she's indifferent to it. She's an ice queen. She'll tell you exactly what she thinks of you with no filters, which makes for some acidic interactions with Hikki. YUI - a nice girl who was the Service Club's first customer and chose to hang around afterwards. She likes both Hikki and Yukinon a lot, which just goes to show what a kind heart she has. Unfortunately has a history of being overly subservient and easily oppressed by school cliques at school, but at least this means she can talk to people in a way the other two can't. Even the teacher who pushed Hikki and Yukinon into the Service Club sees it mostly as a psychotherapy group. She's trying to turn them into human beings who can fit into society. Obviously there's lots of material to play with there, but quite often it's the supporting characters who are the most interesting. One assumes that a protagonist will be fine in the end (although I believe Season 2 is going to stretch that) but one's less confident about Rumi Tsurumi in eps.7-8 and Minami Sagami in the culture festival arc. There are some broken people in this show. Obviously no one has a shred of romantic competence. (This even includes their teacher.) The nearest Hikki gets to self-awareness in that is realising that he's mooning over a pretty classmate who's a boy but keeps getting mistaken for a girl. Yui also has hints of bisexuality. It's an intelligent show. The dissection of classroom psychology can be almost woundingly thorough, c.f. Rumi Tsurumi. This includes charismatic alpha males as well as social lepers. However it's also funny. I'd been led to expect something more heavyweight, but I should wait until I've seen Season 2 before going any further on that one. It's refreshing in its cynicism and its willingness to put the boot into its broken main characters, but also charming in the way that they're secretly sympathetic under their shells. It's good, interesting and going beyond the usual anime formula. "I'm an adult! I'm mean, I tell dirty lies, I'm underhanded..."